With the opening of Toy Story Land at Hollywood Studios, arrives a new counter service restaurant, Woody’s Lunch Box. Serving foods that bring back childhood memories of old, this restaurant offers, tater tots, pop tarts and sandwiches. Some sophisticated flavors may be too sophisticated for your little one. But other flavors may be just right! 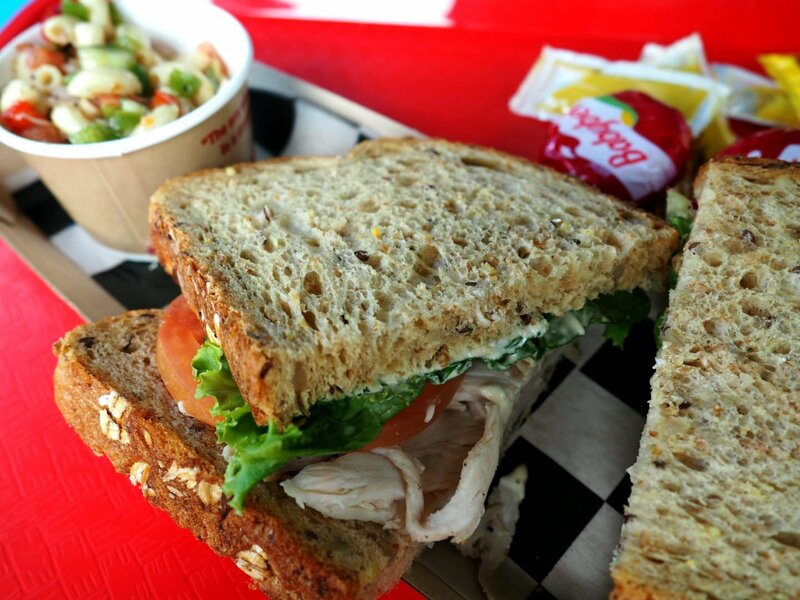 Here’s our real take on Breakfast and Lunch/Dinner at Woody’s Lunch Box. Right off we should admit that we had been waiting for Woody’s Lunchbox to open since we saw it in the concept art. We stalked the menu, read the ingredients and went into our meals with purpose and a plan. As you may imagine, our hopes were pretty high! Woody’s Lunch Box restaurant is an outdoor counter service window that offers mobile ordering, which you will want to take advantage of. This space has minimal table seating outside. Very minimal. The space for the restaurant can seat maybe close to 100 people, but that’s it. So consider that when deciding if you’re going to order food and sit, or grab food on the go. 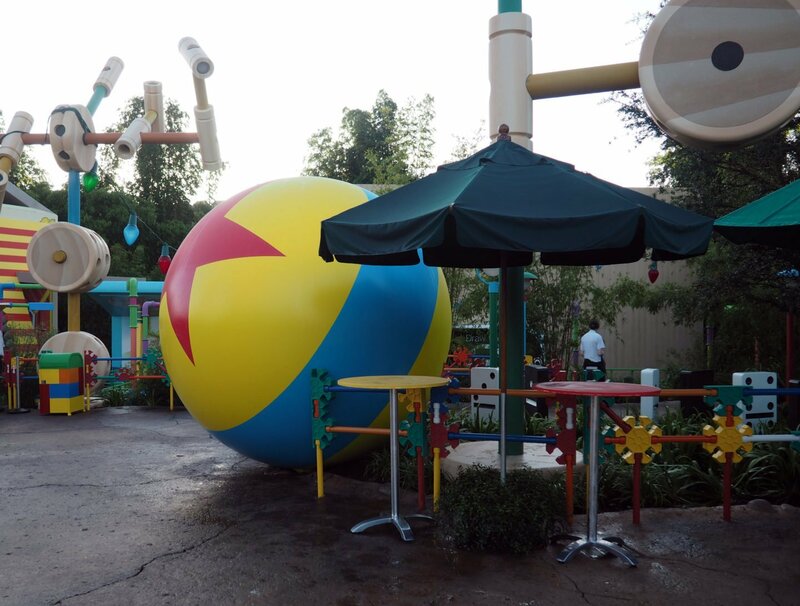 The lack of indoor seating will end up being an issue in the summer months when other Hollywood Studios quick serve locations like ABC Commisary and PizzeRizzo both offer air conditioning. 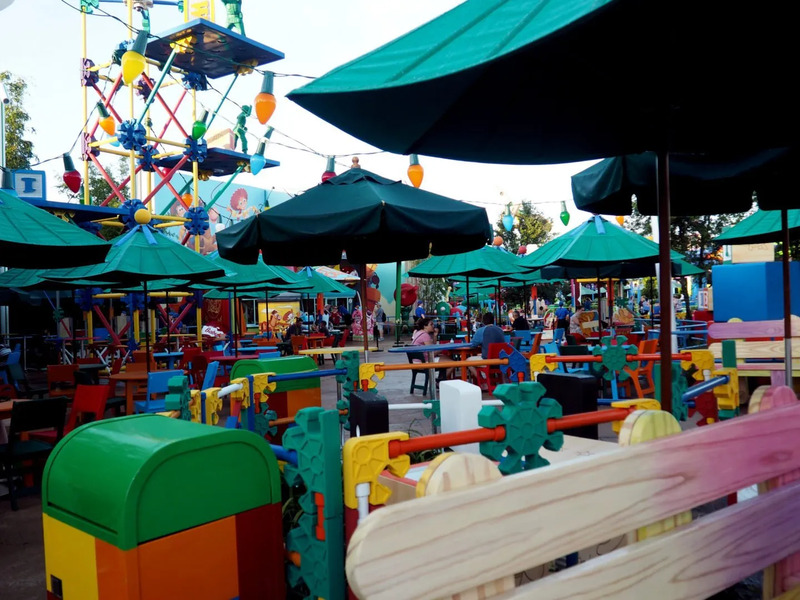 But chances are this fun, cute land and restaurant will always be on our fall schedules when the outdoor air is friendlier. 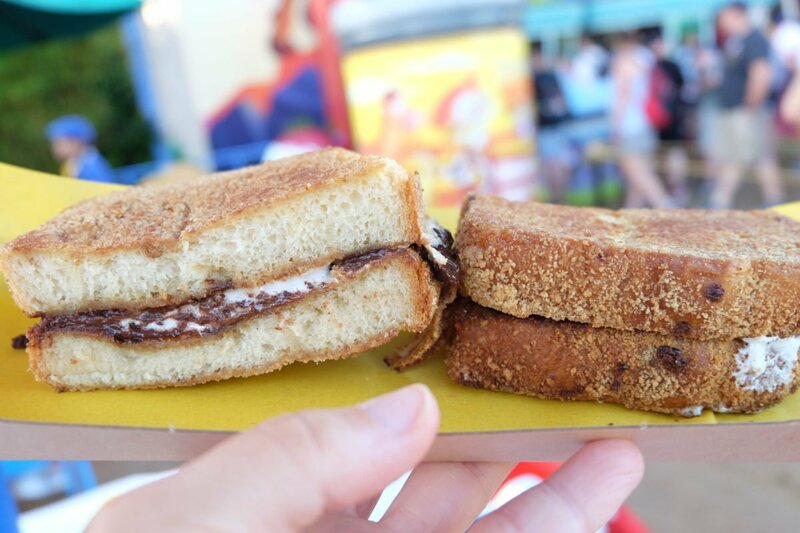 When it was announced that Woody’s Lunch Box would be the new quick service at Hollywood Studios, we heard lots and lots of hype over the Smore’s French Toast. Heck, it looked great on the DisneyParks Blog and we could not wait. So we were thrilled to finally be able to try it. This is a brioche bread, covered in crumbled graham crackers with chocolate chips and some marshmallow fluff in between. For us this was pretty disappointing! 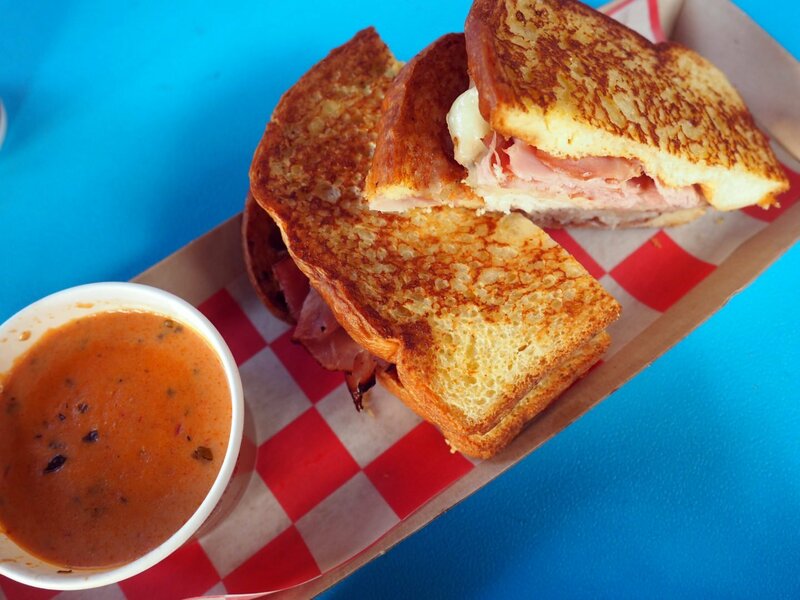 Mainly because the flavors here are very light, at least on our sandwich! We did hear that there have been issues with sandwich consistency due to the crowds. There needed to be more chocolate chips and quite a bit more marshmallow as the two pieces of bread totally overpower all the other flavors. The bread was also not as flavorful as we would have hoped for having such a starring role in this sandwich. If you’re with kids though and you know they won’t like the green stuff in the turkey sandwich, or the weird gravy in the egg bowl, the s’more french toast will do just fine! 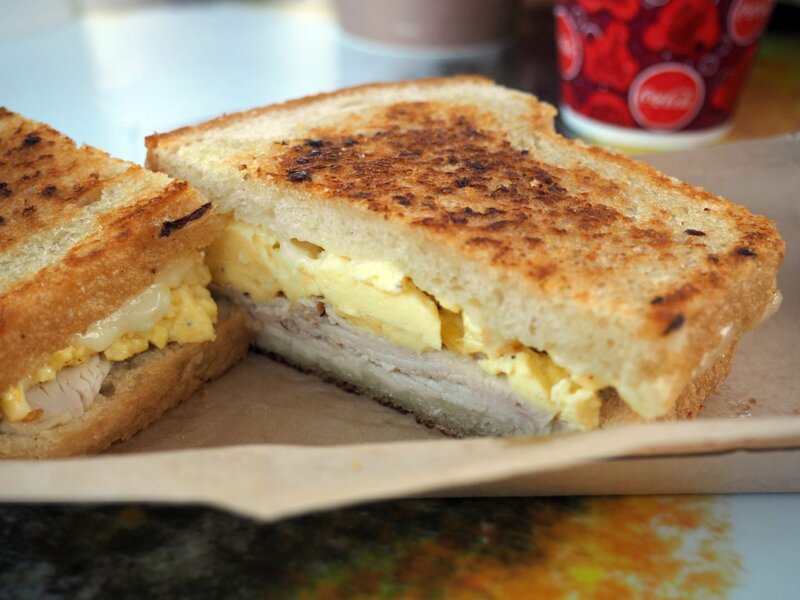 This is deli turkey, egg and some sparse spicy peppers on a sourdough bread sandwich. The treat here was the sourdough, absolutely delicious. Everything else sort of got lost. The egg wasn’t flavorful enough, the turkey overpowering and the peppers not enough. If you’re looking for something hearty, but bland enough for the kids to like, this may be your sandwich. 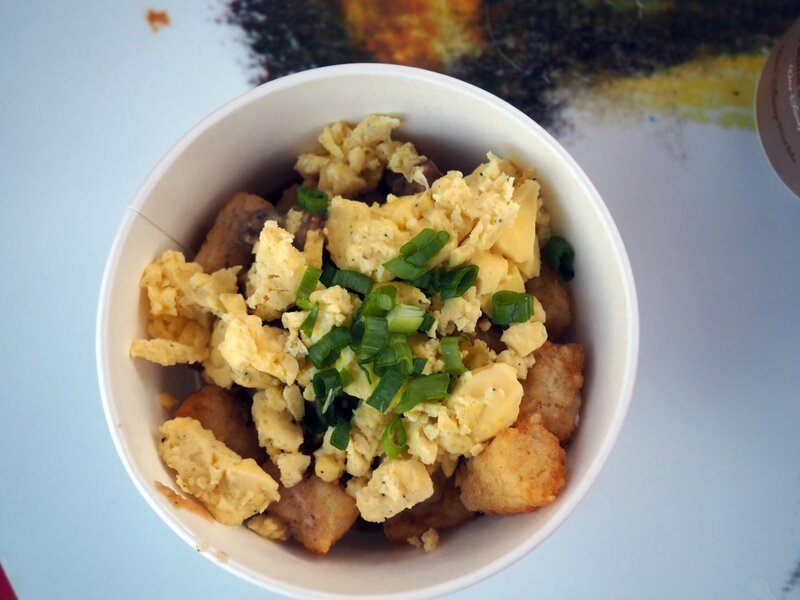 This bowl came with egg, tater tots, sausage and a brisket gravy with chives. This was by far the best meal of the morning. Its hearty, and there is plenty of it! The flavors merged nicely and it comes in a big enough bowl to really stir everything around in the gravy. Really pleasantly surprised with this one. A great alternative to the basic Starbucks breakfast sandwich we usually grab at Hollywood Studios. Arrive at park opening: If they’re offering extra magic hours in the morning, arrive right at 7am. 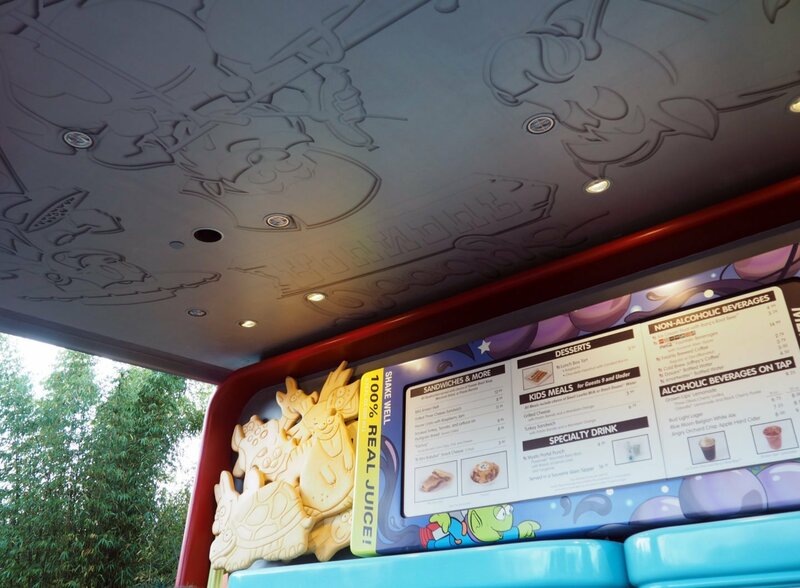 Ride the Slinky Dog Dash and then head over to Woody’s Lunch Box. If you wait until later you may not have a place to sit. This isn’t street food, so you can’t eat it while you stroll. Coffee: There is a cold brew coffee option at Woody’s Lunch Box, but both times we tried to sample this coffee, they were out. That said, you should probably try and grab your coffee at Starbucks on the way in, or plan to grab it later. Mobile Order: Woody’s Lunch Box has a mobile order option and we highly recommend you use it. Mind you, many of the people using mobile order, don’t technically know how it works. 3. Go to the Mobile Order pick up window and let them know your name because your food is ready. You may have to trudge through a sea of people who are waiting for the orders at the window who have not yet received the Step #2 instruction. They will surely mention to you that you need to wait to be called. But nevermind them. People with mobile orders don’t wait to be called. You simply let the girl at the mobile window know your name and that you’re there for pickup. Along with the sandwiches below you can order a macaroni salad, Babybel 3-pack of cheese or tomato bisque soup as a side. All three of these side are pretty nice. The tomato soup especially is such a treat and highly recommended. And you really can’t have a lunch box style meal without Babybel. The three cheeses on this sandwich are cheddar, provolone and a cheddar cream cheese. It’s a lot of cheese. While still good, we agreed that if this was a different combination of cheeses this sandwich would have been amazing. The bread is garlic bread and quite lovely. Tip: If you dip this sandwich in the tomato basil soup it tastes like pizza! G didn’t seem to love this sandwich, as the meat was sort of a tough roast beef style thin. 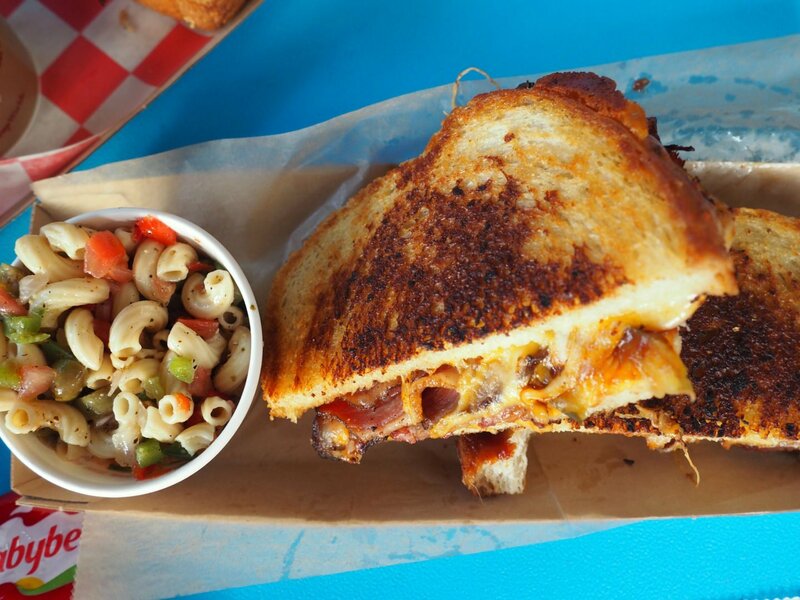 Melanie enjoyed it though as the flavors meld well though with brisket, Monterrey cheese and BBQ on sourdough. Other grown ups we know also loved this sandwich, so it’s definitely worth a try if you can stomach the 13 dollar price tag. 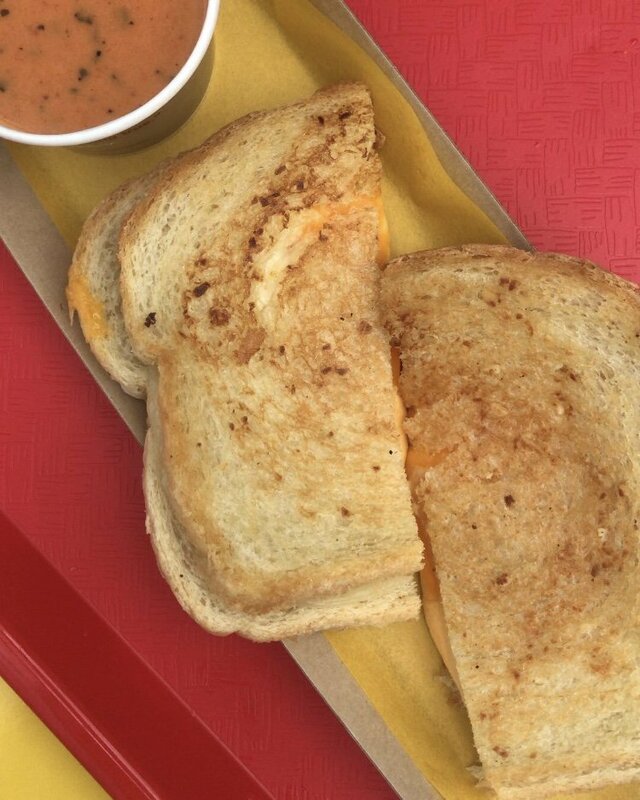 By all means our favorite lunch sandwich! Not as good as the one at Disneyland, this Monte Cristo sandwich comes complete with raspberry jam, turkey, ham and cheese all built into the sandwich. The Monte Cristo was definitely a unique offering for Walt Disney World so we were excited to see it added to this menu. Much like the Turkey Sandwich at breakfast this is your basic turkey, tomato, lettuce and mayo on sourdough bread sandwich. Pretty decent and hearty if you’re hoping to forego dinner, but nothing thrilling here. Just typical lunchbox food. Not that it’s bad, it may be exactly what you and the kids are looking for, without the pain of making it yourself. These Tater Tot Nachos combine tater tots, chili, cheese, corn chips, sour cream and chives. These come in a pretty decent size bowl and are the showstopper for completely indulgent kid food. Lots of chili, stretchy cheeses and tater tots make this fun for the little ones if they like chili. 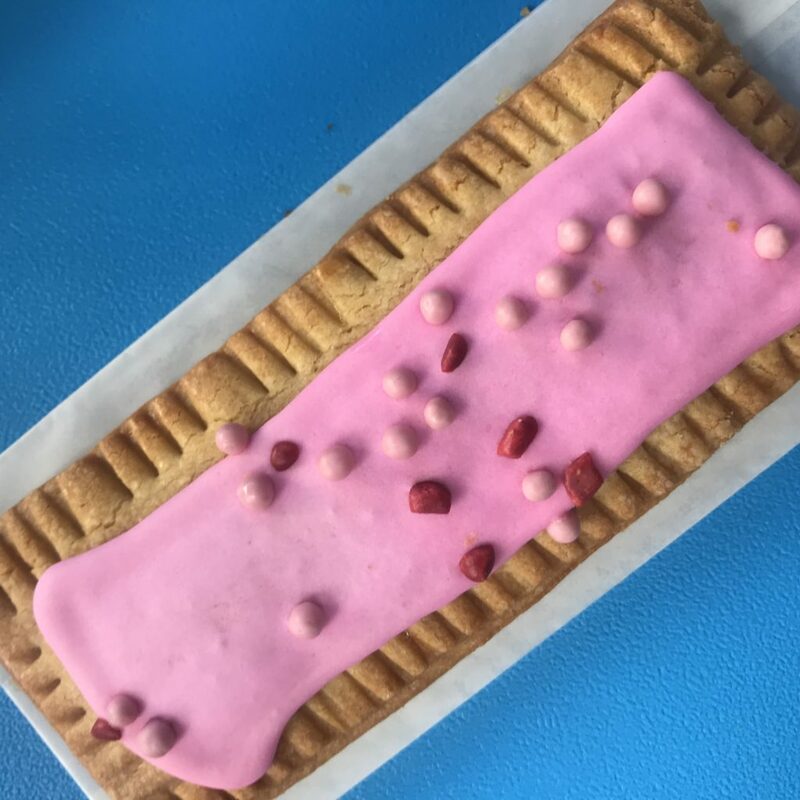 Homemade Pop Tarts in Hazelnut and Raspberry are offered for less than 4 bucks each and can be shared between two people. Truthfully, we were floored by how wonderful the Raspberry Tart was. 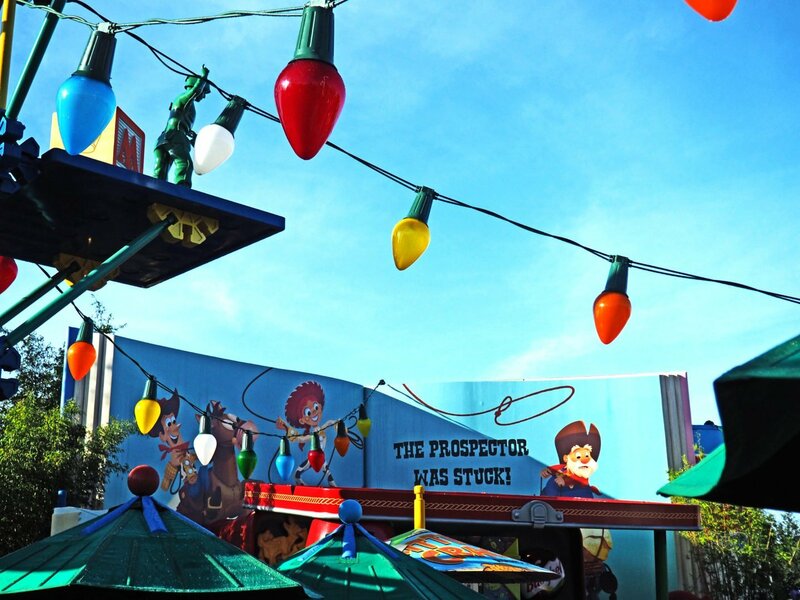 It’s officially made our Toy Story Must Do List and for good reason. Reminiscent of one of our favorite Christmas cookie recipes, the dough is buttery and flaky, filled with a good amount of raspberry jam and topped with icing. 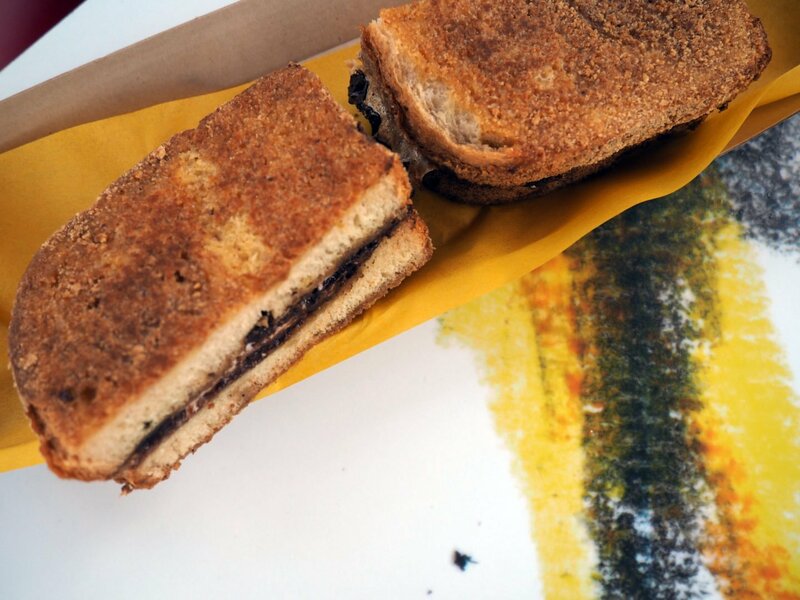 Know that the Hazelnut Pop Tart is not officially filled with nutella. Sad but true. Both though are delicious and a perfect mid-day snack if you’re looking for a food experience here but not a meal. 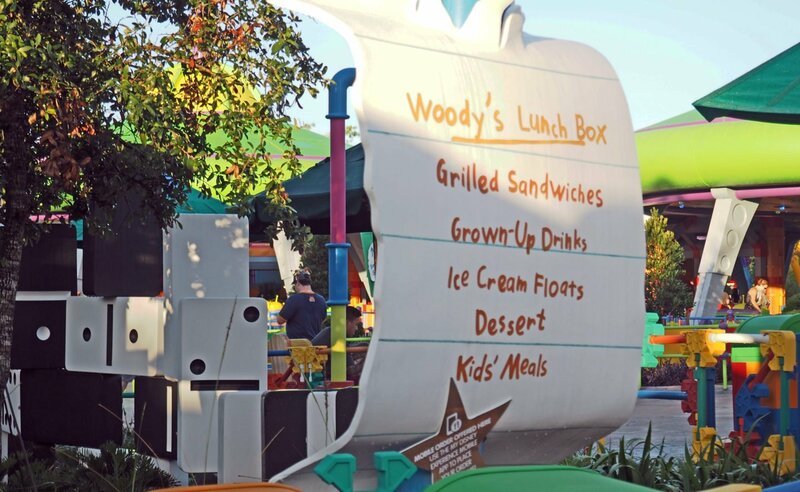 Eat Early or Late: Before 11am and after 4pm are the best times to try and grab food at Woody’s Lunch Box. It’s no surprise that the parks are crazy busy from 12-4pm. Before 11am you could be fighting breakfast crowds but if you wait until noon all the seating will be gone. After 4pm the crowds disseminate a bit to go to dinner reservations elsewhere. Special Drinks: While Toy Story Land does have fancy drinks, they are sugary! And in a land without shade in the middle of Florida that sugar will dehydrate you pretty quickly. Opt for water instead. Mobile Order: Again, mobile ordering will be your best friend for Woody’s Lunch Box. Follow the steps above to make sure you get your food without too much inconvenience or waiting. You Could Just Grab Dessert: Without the allure of indoor seating, or enough seating, you and your family may want to just have breakfast, lunch or dinner elsewhere. If that is the case, grab a few pop tarts so you at least get the Toy Story Land treat experience. We also love this snack as a treat you can settle with on the nearest bench, waiting for the next Army Patrol show that takes place in front of Alien Swirling Saucers. Grab the times guide at the Hollywood entrance for show times. 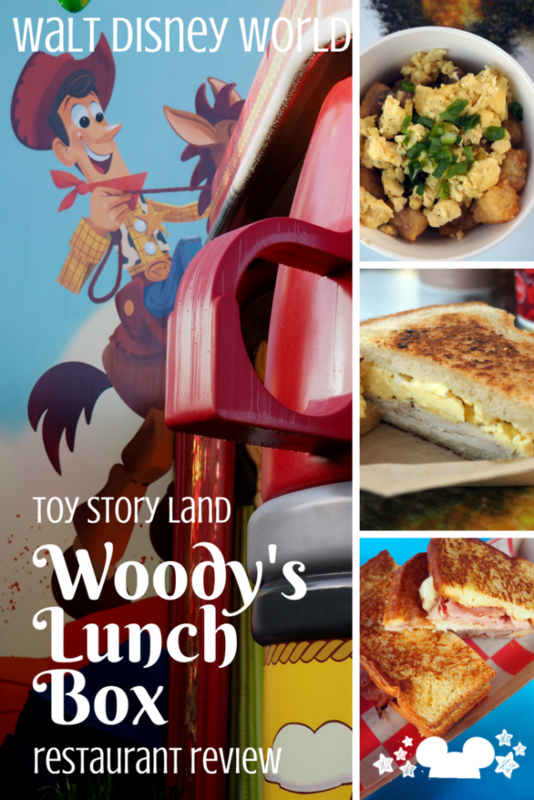 All in all we really liked Woody’s Lunchbox at Toy Story Land and would definitely recommend it! Since Hollywood Studios does not have a large selection of quick service restaurants that offer up unique, yet accessible menu for the whole family, we were excited to find a restaurant that had a nice variety of easy options for both kids and grown ups. We are also super aware that with visiting so close to opening day that mass production was probably in play. So we’re hoping to re-try some of these food when next we visit, and others on the menu we missed. We’ll keep an eye on this one for new foods, so stay tuned!